I am very impressed and satisfied with the services provided. I needed a couple of documents to be translated and found them through google with great reviews. I received those documents before the day I was told they would be ready, professionally done, and all my questions were answered. I was contacted on the status through the process. They are very affordable compared to other quotes I received. I highly recommend them and would also use them in the future. The owner is very professional and has great customer service manner. Homeland Language Services is amazing! Christian Lanazca and Ricardo Gonzalez are amazing, thanks a lot I needed a few documents translated. The customer service we experienced was outstanding! They are very professional and accommodating! They translated my documents quickly and if there were any discrepancies. Homeland Language Services is amazing! 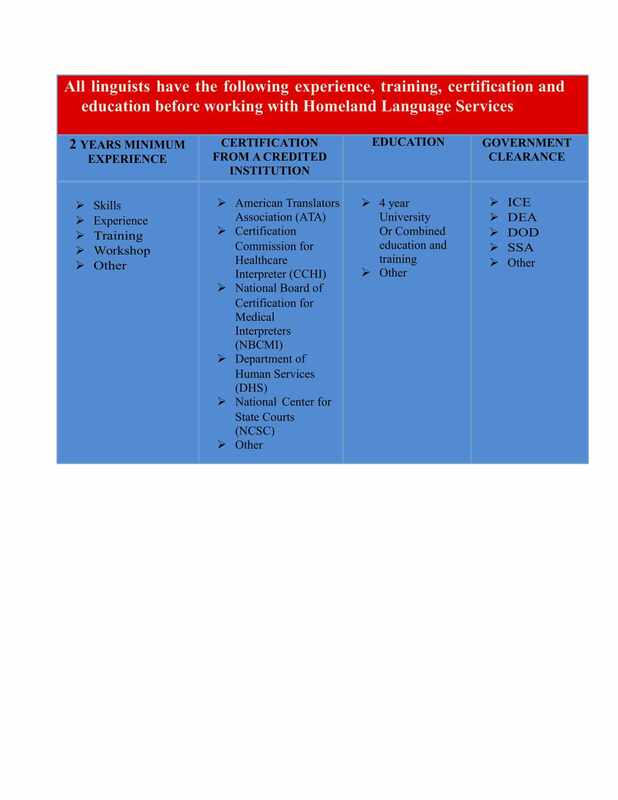 We needed a couple of documents translated and while searching for a translator, we discovered Homeland Language Services. The customer service we experienced was outstanding! They are very professional and accommodating! They translated our documents quickly and if there were any discrepancies, they contacted us right away to make sure we knew what to expect. We will definitely be using Homeland Language Services for all our future translation needs!